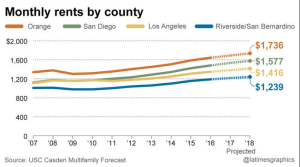 A new report compiled by Beacon Economics and USC’s Lusk Center for Real Estate is projecting approximately 4% increases annually in rental costs for Los Angeles through 2018. While more apartment units are being built, the demand is expected to outstrip supply for the foreseeable future. Most of the new construction is at the high end of the market to fill the demand from the influx of tech industry professionals. On the other end of the spectrum, the UPI is reporting this morning that a softening economy is at least temporarily pushing down mortgage interest rates again. This week’s rate was 3.58 percent. At this point last year, the same 30-year mortgage was 3.67 percent. This week’s rate was also the lowest rate since May 2013 and good news for buyers and refinanciers. 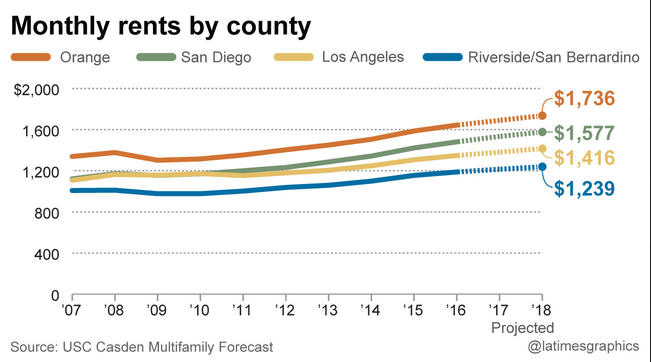 As increased inventories of homes hit the market in May and June due to normal season fluctuations, the time will be ripe for purchasers to buy prime real estate and fix their monthly housing expense for years into the future. Buying in May or June may slightly increase the buying price of the home, offsetting some of the savings now available because of low interest rates. However, the wider choice of homes on the market makes this a much better time to shop. Also be aware that there will be more shoppers, therefore being prepared for the bidding wars and know how to win the home of your dreams is going to be critical. I can’t say enough good things about Belle. I bought a condo in L.A. while I was still living on the East Coast with plans to relocate, and Belle made it completely seamless. She was referred to me by the mortgage broker whom I used (also great, I’ll write a separate review for him). Belle is efficient, detail-oriented, and savvy about both the local real estate market and all the ancillary booyah that you have to deal with as part of the process (which inspections are worth paying for, etc.). She’s totally can-do and gets things done. She’s incredibly helpful even post-closing. She’ll share her rolodex for any contractor or home-related service you need, and she’ll go above and beyond the call of duty. (The building’s management company says you have to update your name on the building mailbox yourself and they’ll leave a sticker out for you? You can’t do that from 3000 miles away and your mail is already being forwarded? Belle takes care of it.) You’ll be in good hands. This entry was posted in Home Buying Tips, interest rates, los angeles real estate, mortgage financing, real estate, rental costs, Santa Monica, Santa Monica Real Estate and tagged in Marina Del Rey, Pacific Palisades, real estate, Venice, West LA.